Collecting is normally split between Disneyland and Disney World. An interesting subset is the land in between: Disney machines outside the resort properties. Putting a complete set together is a real challenge. These coins seldom hit the market. Even finding a list is difficult. 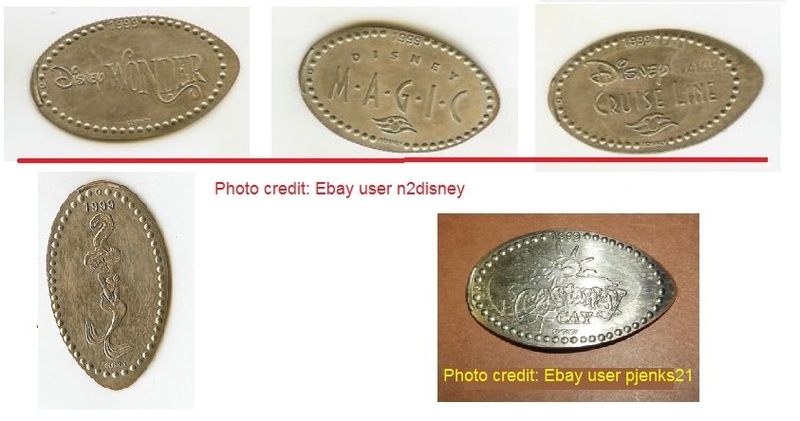 The key resource for Disney World coins, www.presscoins.com, only recently began cataloging the current off-site coins in Florida. The best Disneyland guide, www.parkpennies.com, chronicles the Chicago Disney Quest set as well as other non-resort locations in California. The best resource turns out to be www.pennycollector.com, which reports on current and retired elongated coins of all types all across the world. 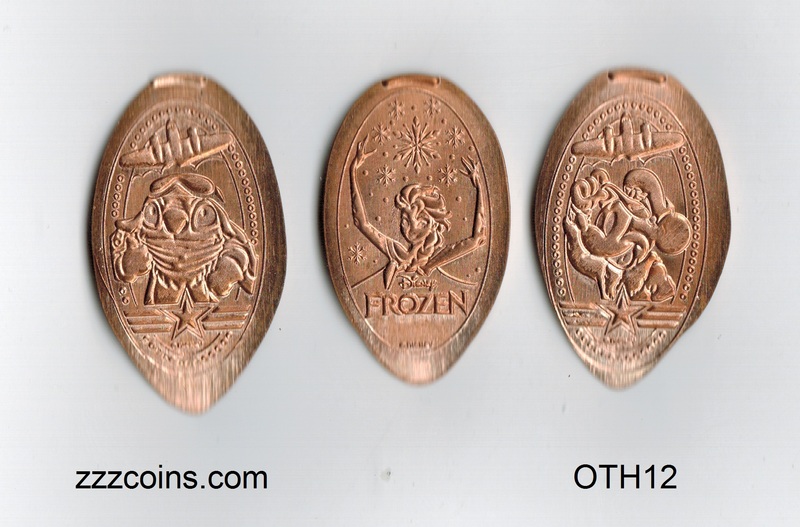 While pennycollector disclaims specialized knowledge of Disney World, its worldwide corps of collectors do a good job updating the types of coins I am including here. 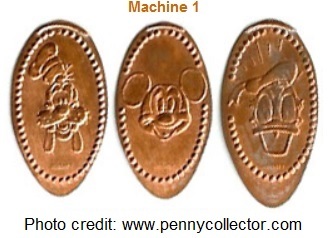 The only downside is that pennycollector groups its pennies by location rather than theme, so you almost have to know about a location to find a reference to it. Disney Quest was intended to be a nationwide chain of indoor amusement parks, but only two were built: the one at Disney World’s Downtown Disney, and one in Chicago on Rush & Ohio Streets that closed in 2001 after only two years. 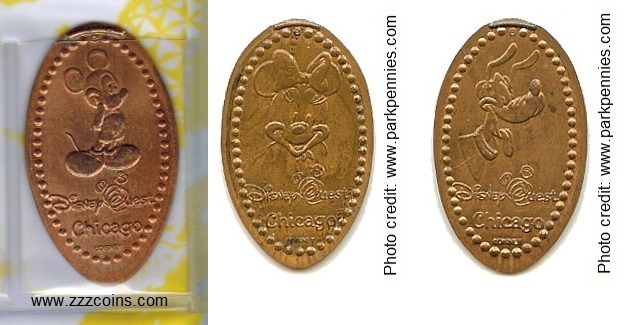 The Chicago branch had a penny press machine that pressed three coins featuring the Disney Quest Chicago logo and Mickey, Minnie and Pluto. The Disney Information Center was a building just off I-75 in Ocala, Florida, that offered Disney travel information and ticket sales. They had a 3-die machine featuring classic characters, but without any notation of the information center. I don’t know where the Information Center’s machine was moved when the center closed in 2006 after 18 years of service, done in by the Internet era. These dies are fairly common, though, and I think they may have ended up at Cap’n Jack’s Oyster Bar (in Downtown Disney). Disney’s Earport is one of two Disney theme park shops at Orlando International Airport. 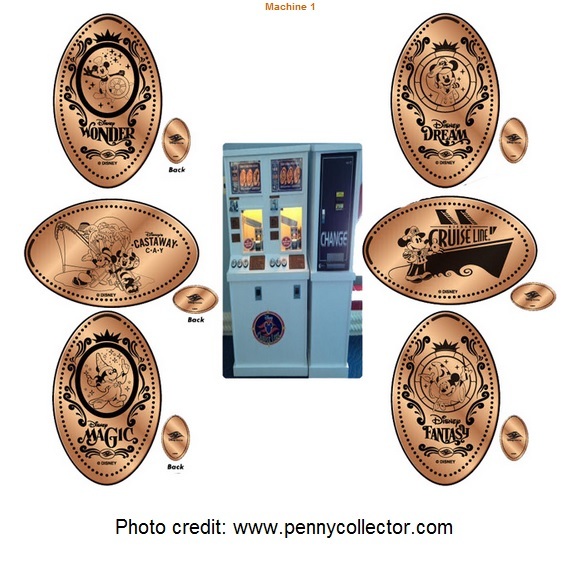 Other theme park stores (Kennedy Space Center, Sea World) have featured pressed pennies, but Disney finally placed one of its machines in 2015. Two of the three dies were created for the site (pilot Stitch and pilot Mickey Mouse); the third die is a “Frozen” design that was moved from a machine at the parks. This set remains available today. Another set available today is the Vero Beach Resort set, found at two machines on Florida’s Atlantic coast. Three pennies and one quarter are found there. The quarter features the turtles from Finding Nemo and the Vero Beach logo. 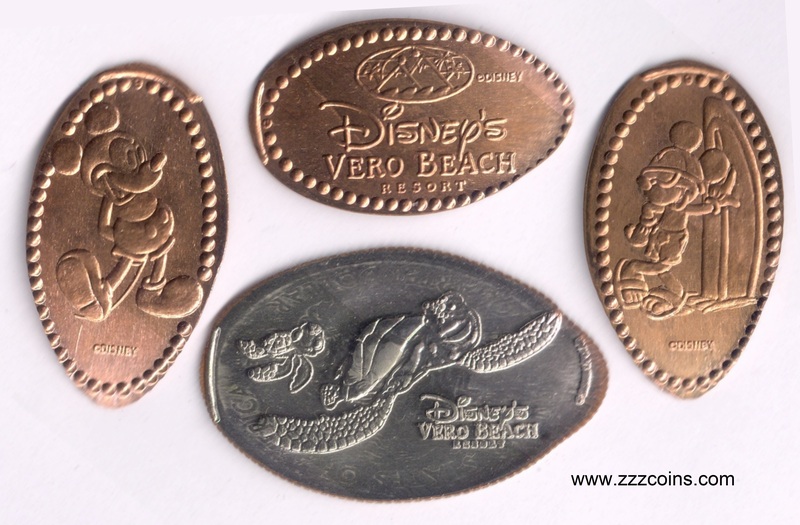 A penny has the Vero Beach logo, and two other pennies present non-Vero-specific designs (Mickey and Mickey with surfboard) that can also be found on the Lake Buena Vista property. I have visited Vero Beach twice as a non-guest and was allowed to go inside to press coins. Hilton Head Island in South Carolina also has a Disney resort on the coast. 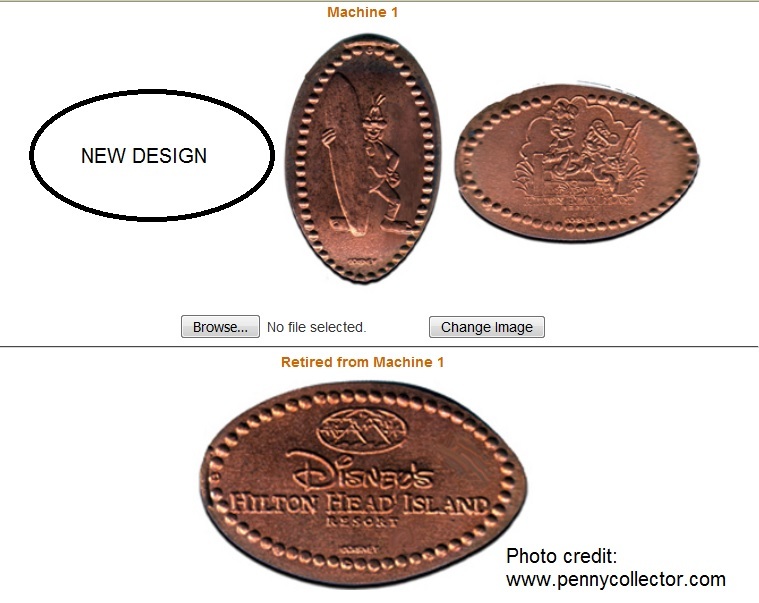 A penny design with the Hilton Head Resort logo is recently retired. Three other designs remain available. All are unique to the Hilton Head property – Sebastian with maracas (not pictured); Goofy with a surfboard; and Mickey and Minnie on the beach with “Disney’s Hilton Head Island Resort” below. I have not been to Hilton Head, but I assume non-guests can enter to press coins as they can do at Vero Beach. Disney’s Worldport store was located in Orlando. I do not know how long the store was at the Pointe Orlando Shopping Center, but the report on pennycollector.com indicates the store was gone by 2006. The store seems to have been under the radar – a Google search shows the store is mainly mentioned in the context of a toy recall in 2003. The coins have Goofy, engineer Mickey and conductor Donald. All three also have “WORLDPORT” on the bottom border. 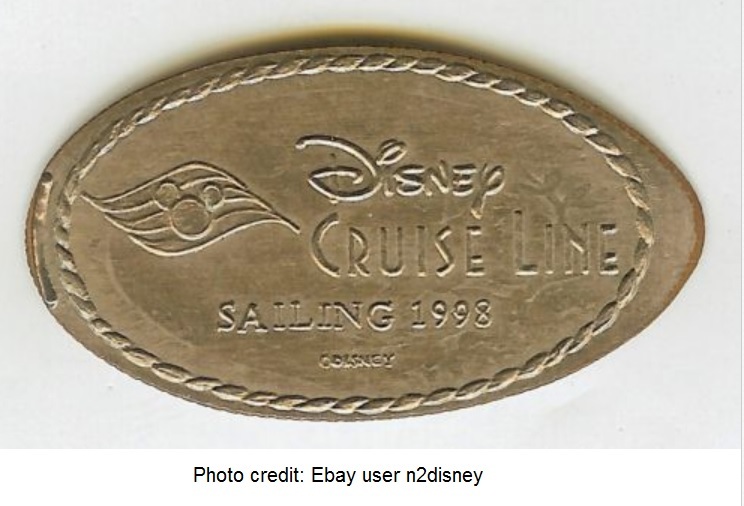 Disney Cruise Lines is a real thorn in the side of collectors. Two machines currently produce six coins in the cruise line’s terminal at Port Canaveral, Florida. Cruise lines have airport-like security, and the machines can be reached only by ticketed passengers. There are also various retired quarters from the Disney Cruise Lines. Although I do not have complete information, Ebay listings seem to indicate that dated coins were issued from 1998 through 2000. I am not sure whether these were available on the ships or in the terminal. It seems likely that there are other quarters available. 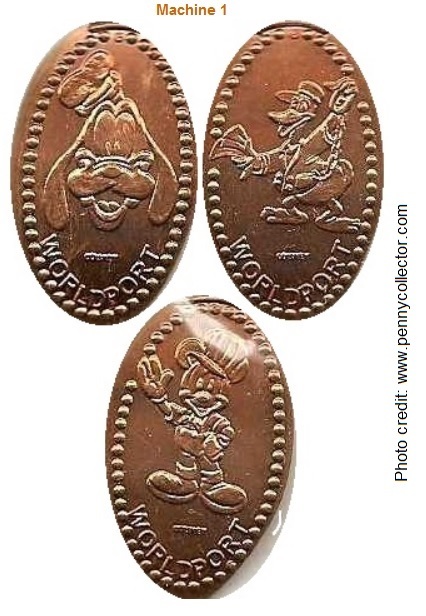 In coming weeks I will publish an article with Disney coins west of the Mississippi – another fascinating area of collecting. This entry was posted in Disney in other states, Florida, Off-site locations in Florida, Retired/removed on October 9, 2016 by jnmcnally.